Having pets doesn't mean you have to give up on having a beautiful home. I have bought many products over the years for our dogs, and some worked, some didn't. 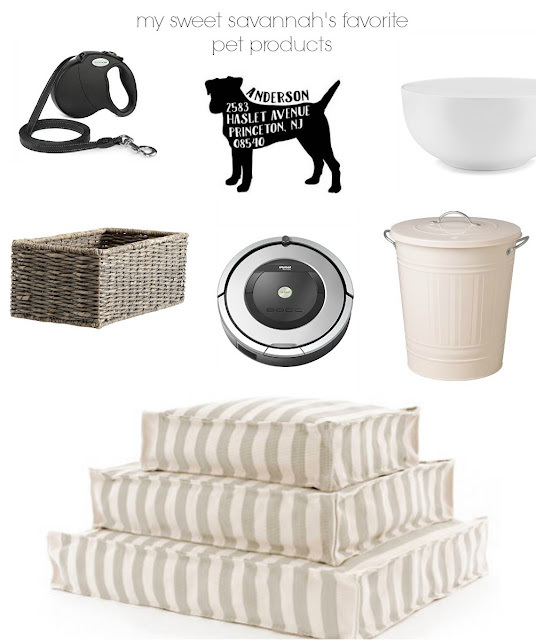 Here is a list of my favorite pet products that will not make your home look like a pet store. I have one of these for each of our dogs. I got a color that would blend in nicely with the colors of our bedroom, which is where they sleep. I also like the fact that I can move these outdoors in the warmer months. It comes with having pets. Not only dog hair, but also anything else they drag in from outside. This not only picks up the dog hair, but it gets under chairs and in tight spaces. I like to use white serving bowls for our pets food and water. You can place them on a small rug or place mat if you'd like. I love being able to control how close or far away I keep my dogs when out on a walk, especially when cars go by. Plus, they haven't been able to chew through this one. These can be tucked on shelves, or even out in the open they are attractive. Trash bin with lid for food. I love these for storing dog food in. This is just too cute, I had to include it.